A fabled tenth planet out beyond Neptune, often referred to as Planet X, hasn't been found despite years of searching. But astronomers involved in the hunt are beginning to speculate that something like Planet X will be discovered, along with Y and Z. In an emerging new theoretical view of our corner of the galaxy, several worlds larger than Pluto -- a few perhaps as big as Mars -- lurk in the outskirts of the solar system. Some are so far away that it would take more than a year, traveling at the speed of light, to reach them. For years, astronomers have been scouring the Kuiper Belt, a region past Neptune that's loaded with comet-like objects. The Kuiper Belt extends out to some 5 billion miles (8 billion kilometers) from the Sun. That's a little more than 50 times the distance between Earth and the Sun, or 50 astronomical units (AU). "Given that our survey has covered almost the entire region of the Kuiper Belt, I'm willing to bet these days that nothing larger than Pluto will be found in the Kuiper Belt," says Caltech astronomer Mike Brown. University of Arizona astronomer John Stansberry used NASA's Spitzer Space Telescope to obtain actual albedos for some of these icy objects. "Our results have albedos ranging from 6 percent to 18 percent for the eight objects I've analyzed," Stansberry said. If a KBO is brighter than thought, then less surface area is required to reflect the amount of sunlight that was measured -- so the object's size must be revised downward. Last November, Mike Brown's team found a world at least half as large as Pluto. They named it Sedna, after the Inuit sea goddess. Sedna's elongated orbit is outside the Kuiper Belt, ranging from 76 to 1,000 AU. Nobody expected to find an object like Sedna in the largely empty space between the Kuiper Belt and the Oort Cloud. Theorists are now scrambling to explain Sedna's presence and what it means to the composition of the outer solar system. "Sedna could be a member of a substantial population of bodies trapped between the Kuiper Belt and Oort Cloud," says the University of Hawaii's David Jewitt, who made the first accurate estimate of a KBO albedo in 2001. Brown, who now bets against finding Planet X in the Kuiper Belt, thinks his group's discovery of Sedna portends an even more compelling scenario. 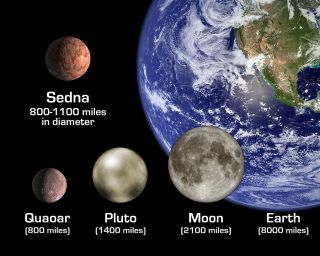 "I'd also be willing to bet that there are many objects larger than Pluto out in the region of space where Sedna lives," Brown said last week. Out to about 1,000 AU, he speculates that there could be 10 or 20 Pluto-sized objects, "and a handful of larger things, too." Some of these suspected worlds could be as big as Mercury or even Mars, he said. "Absolutely," he said. "Probably even likely." "Pluto-sized planets in distant near-circular orbits are beyond the reach of current searches," said Lowell Observatory astronomer Bob Millis, who leads a team that has found more than 400 KBOs. "Future searches tuned to more distant objects and using large telescopes ... can begin to probe this region." "It is certainly possible that one or more objects as large as Pluto remain to be found inside about 70 AU," Millis told me. "No searches performed to date are complete in this region," although he added that the survey by Brown and his colleagues, Chad Trujillo and David Rabinowitz, "has substantially reduced the likelihood" that such objects exist. "Beyond about 70 AU," Millis said, "it is anybody's guess." Nemesis: Does the Sun Have a Companion Star?